At age 7, Benjamin Croft began piano and trumpet lessons, later going on to study at Leeds College of Music. His career has been eclectic since graduating, first playing on cruise liners and then moving to the US and touring the world as a session musician with several big-name acts. He relocated to London in 2012, becoming a regular performer at London jazz venues. 10 Reasons To… is his first solo album of 12 original compositions and is a melange of styles and influences from his childhood onwards. The CD artwork, by Andrew Skilleter, has a very ‘70s prog rock album feel, reproduced in the sonic landscape on the CD, which features a mixture of keyboard instruments including Steinway, Mini-Moog, Prophet 5 and Mellotron. 100 Years at Sea Introduction opens the performance with an Edgar Allan Poe verse, The City in the Sea, voiced by the late Peter Miles (of classic Dr Who fame). 100 Years at Sea follows rapidly on, an upbeat slightly funky number with McLean’s violin to the fore. One Million Years At Sea will take those of a certain age (and younger prog rock cognoscenti) straight back to the seventies with its synth sound. Bad Reputations continues the general feel, but with violin overlay – giving a distinct fusion, jazz-rock groove. T.T.E (Time, Talent and Electricity) is the first of four tracks specifically dedicated to Croft’s keyboard heroes, in this case, Keith Emmerson, and with more of a jazz feel on Steinway piano, floating flugelhorn from Davies and prominent acoustic bass input from Castronari. The Sycophant reintroduces the jazz-rock feel with a strong bass groove from Thomas on a Westone Thunder III over Mailliot’s rock drumming. The Whispering Knight reintroduces the jazz feel with Davies on trumpet this time and Croft on Rhodes. No Oil For Sale (for Gustav Mahler) continues in the jazz vein, but with quasi-orchestral synth sequences. The Legend of Bray (for Christopher Lee) features Thomas on acoustic fretless bass, this is probably the closest of all the tracks to a ballad with sweeping overlay by violin. Inside Immortality, at 1.29, is (ironically) the shortest track on the album but at least does lead swiftly into See You in Another Lifetime, a bass-heavy track with jazz-rock overtones (stadium jazz, rather than chamber jazz). For Future Past (for Allan Holdsworth) closes the show with another vocal contribution by Peter Miles. There is no stadium roar – this is very much a studio album: the band recorded at Livingstone Studios, London; the synths were recorded at Greystoke Studio and mixing was at The Nave Studios, Leeds. Overall, this is an interesting album with a mixture of styles, including jazz. Is this a jazz album? Well – according to the constabulary, probably not, but it certainly features many styles of music that have been played under the jazz umbrella over the years. Is it worth checking out – with an open mind about what might constitutes jazz? Yes. The musicianship is superb from all quarters. The overall sound quality and flow are excellent, just don’t let the rozzers catch you listening! 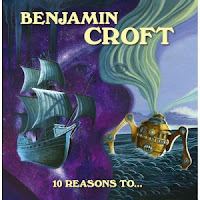 10 Reasons To… is available now. Catalogue: 33 JAZZ275. PS: Those concerned with saving endangered species will be pleased to know that “No melodicas were used in the recording of this album”! EP/CD Review: Animal Society - Rise. If You Can't Use It - Don't Waste It!